Now you can enjoy these iconic scenes as wearable art with your choice of casual driving shoes. Be sure to enter promo code HUNZ99 during checkout where it says, "Have a Promo Code? Apply it now." to mark your new shoes down to just $99 (while supplies last)! 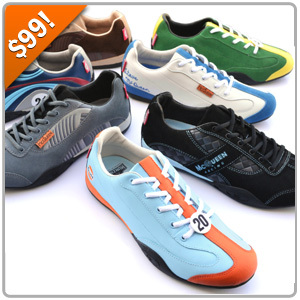 Click HERE for Hunziker Shoes! Last edited by Dmitry at Pelican Parts; 11-14-2018 at 09:20 AM. ....picked up the Gulf livery. Epic. How is sizing relative to true? I have 5E wide feet and these work.